Record Checker is a computer program presented as a tool that can help you find out whether the person you meet online has any shady past, or not. This program is promoted at recordcheckerapp.com and can also be distributed alongside freeware programs, such as browser add-ons, media players, and system optimization programs. 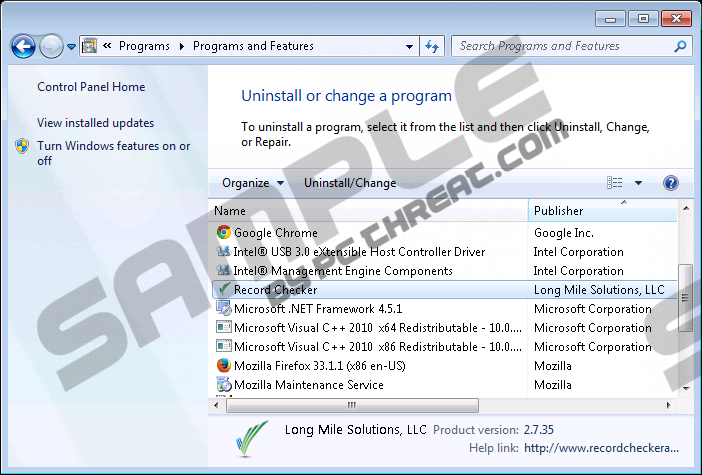 The program does not create any browser extensions, but it supports Internet Explorer, Mozilla Firefox, and Google Chrome. In any case, we strongly recommend that you remove Record Checker, and soon you will find out why. The Record Checker program is very similar to Security Alert, News Alert, Finance Alert, and some other programs that are promoted on almost identical websites. The Record Checker program is claimed to be distributed by Long Miles Solutions LLC, which is likely to use different names to distribute programs similar to Record Checker. Record Checker is available at no charge, and, in return for its free service, you are supposed to put up with some third-party advertisements. Record Checker displays advertisements that vary in form and content, and this characteristic is one of the reasons why you should remove Record Checker from the computer. Due to this feature, the Record Checker program is categorized as adware; hence, the program is included in the detection database of our recommended security program. On top of that, you should bear in mind that the program may be monitoring you. The developers of the program, as well as third parties, are interested in how you browse the Internet and interact with the Record Checker program. Therefore, your clicks, browsing history, search terms, browsing history, browser settings, etc may be recorded by Record Checker. You can prevent this program from monitoring you by removing the program, so take action right now. Below you will find our step-by-step instructions that should help you uninstall Record Checker, but we recommend that you implement a reputable security program that is capable of removing Record Checker. Our expert advice is to install SpyHunter. This real-time security program terminates Trojan horses, browser hijackers, adware programs, and many other threats, which means that it can help you avoid malware and spyware attacks. Having removed the Record Checker program, do not forget to scan the computer so that you can be sure that you can browse the Internet safely. Quick & tested solution for Record Checker removal.